I have been an avid reader: for many years. Actually I grew up with books: reading, and dreaming. Books were my friends: loyal, discrete, sincere, silent. They were with me on the train, at school, during many long summer afternoons, and in the deep night. (I remember reading frightening ghost stories while my parents were asleep). Dear old books are gradually disappearing and passing by. They are shifted away by other forms of entertainment, gradually put aside by screens, and much more quickly consumed. Books lives are now much shorter than in the past. Far too many books are available, and the content quality of the average book is quickly declining. Many people write books, but the same amount of worth books are written. Signal to noise ratio is going down. Shop life of a book is now measured in weeks. Inevitably, cheaper electrons will gradually substitute books. Books will become a form of classic knowledge, with their inefficient cross-referencing, inability for full text searching, and their unacceptable lack of multimedia content. Books will get old and dusty. They will be preserving their words for centuries, buried in libraries shelves. Their pages will become yellow. Some lucky old books will be scanned, and in some way shared to a broader potential amount of readers. Their paper will be digested into magnetic hard disk oxide, in huge datacenters under some mountain. Books will evaporate, their bits dispersed in computing clouds. Immaterial, electronic, aseptic, up-to-date, searchable, multimedia ebooks are growing. Internet connected readers are reding internet connected books. Book pages will share the screen with email, blogs, social networks, videogames. And old Readers are dying too. 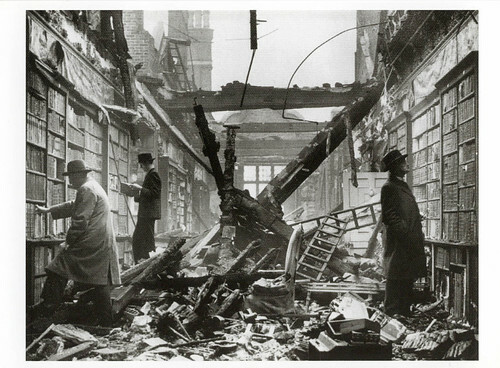 The London Holland-House library after blitz german bombings. Picture taken on oct 1, 1940.